Presence was, uh, absent way too long. Basil Exposition: A lot's happened since you were frozen. The Cold War is over! Austin Powers: Finally those capitalist pigs will pay for their crimes, eh? Eh comrades? Eh? Basil Exposition: Austin... we won. Austin Powers: Oh, smashing, groovy, yay capitalism! Many events and changes in history catch almost everyone by surprise. One of the most notable is the end of the Cold War. Prior to World War II, it was common to hear experts claiming that the Soviet Union was about to fall in a matter of years. During the first five months of the Soviet-German War, German-Anglo-American experts claimed it would collapse within months, or even weeks! But from the winter of '41-2 onward, experts predicting the imminent demise of the USSR looked progressively sillier (Britain stopped making contingency plans for Soviet collapse in late 1942), and by the war's end the opposite mood had set in. Many claimed the Soviet Union would last forever, or long into the foreseeable future, and maybe even win the Cold War. It was thus assumed that the end of the USSR could only come as part of the general End Of Everything — most likely as a result of nuclear war. The (relatively) peaceful end which actually took place at the dawn of The '90s was very much unexpected and was even mourned. Ergo, it is rather funny to hear references to the Soviet Union, the Cold War, divided Berlin and divided Germany in any genre of fiction set 20 Minutes into the Future but written before 1989. Fortunately, the old habit of calling the USSR "Russia" - either due to ignorance or convenience, or laziness, or to annoy them, or to emphasize the differences between USSR's ethnic groups and delegitimise the regime — allowed much accidental retroactive averting of this trope. Well, partial aversion at least - most of the countries called "Russia" are still communist, long after our history's 1991. A lot of fiction written shortly before unexpected events and set 20 Minutes into the Future without those vital events in place can seem ridiculous in hindsight — but usually it's not the author's fault, really. Compare Science Marches On, Society Marches On and End of an Age. See also I Want My Jet Pack, Dewey Defeats Truman and Zeerust. See also Make the Bear Angry Again if the mess-up is somehow reversed, and Jossed If this trope applies to canonical changes. Contrast Why We Are Bummed Communism Fell and Dated History. Note: This trope has been subject to a fair bit of misuse; it is not a synonym for the Cold War. This is for when writers make assumptions about political sitations when writing works about the future, only for that situation to change, retroactively turning the work into an Alternate Universe. British insurance company Norwich Union released an advert in 1989 which suggested the barriers between East and West might soon come down. When they did, they released a second advert , taking credit for their prescience. Angel Densetsu: When Kuroda catches sight of Kaburagi Kiyomi crawling rapidly and sneakily across the grass in an attempt to get a picture of Kitano, Kuroda gets increasingly paranoid and comes up with the theory that she's a Soviet assassin sent to their high school to help start an invasion of Japan. Kitano points out that the Soviet Union isn't around anymore (this episode was written in the mid-90s, several years after the fall of the USSR). Kuroda then speculates that she was with the KGB instead, only for Kitano to note that they are obviously gone too. It's all meant to emphasize that Kuroda is a Dumb Muscle with a very poor grasp of history and current events. An episode of the original Bubblegum Crisis revolved around a stolen super weapon that a minor villain had been going to sell to the East Germans. On the other hand, supplemental materials references to the fall of the Soviet Union and other political changes are pretty much spot-on (though, BGC OVAs being in development in from 86 through 92, it might've just been a later addition). Mobile Suit Gundam 00 has a brief mention of the IRA declaring a ceasefire in the far future (after 2300). This already happened in real life, in 2005, 2 years before Gundam 00 was even announced, however, the organisation that declared a ceasefire was the "Real IRA", presumably some sort of spiritual successor, although there is a real "Real IRA". Same with the Sri Lankan Civil War. In the series, Celestial Being did an intervention to stop the war... which basically just ended in 2009. But it's one of those wars that may or may not come back with new force after a few years, depending on whether the Sri Lankan government is magnanimous in victory and helps the Tamils get back on their feet and addresses the grievances that caused the conflict. GunBuster, made in 1988 but set in 2023, had Jung Freud, one of the Soviet Union's ace pilots. Presumably she was from East Germany. In Ghost in the Shell, the Soviet Union is still going in 2030, though revisions and reprints made after 1992 by Shirow Masamune himself changed this to reflect their downfall. The establishment of the Soviet Union still existing in the future was made in the Appleseed series during the 80s. Ghost in the Shell is a sister series that takes place almost a century before Appleseed, but was written in the early 90s. The United States was separated into three countries after a civil war that took part during World War IV. The American Empire AKA Imperial Americana makes up the largest part of the country, with all the states east of New Mexico, south of South Dakota, and south of the New England area, including Washington D.C. The still democratic United States Of America was reduced to the states of Washington, Idaho, Montana, Wyoming, North Dakota, South Dakota, Minnesota, Iowa, Colorado, Arizona, Utah, New Mexico, and Wisconsin. The New England states, California, Oregon, Alaska, and Hawaii became the socialist Ameri-Soviet Union (revised to the Russo-American Alliance after 1992). The story of SPT Layzner features students from both sides of the Iron Curtain traveling to the moon together on the equivalent of a field trip. At least it actually predicts that the conflict between both sides will end, just much slower than it actually did. Also, the potential end of this Cold War is the stated reason that the aliens show up in the first place, to take over the world before the two sides work together well enough to take over their planet, which they have no idea exists in the first f-ing place. Transformers: Super-God Masterforce refers to Ginrai traveling in West Germany; Masterforce was made in 1988 but set some time after 2011. Patlabor, created in the late '80s but taking place in the late '90s has this. The Brocken military mech that shows up to cause trouble for the Mobile Police in every continuity was said to have been commissioned by West Germany's border guards and the OAV episode featuring it has it "accidentally" falling into the hands of communist sympathizers as part of some kind of ill-conceived War for Fun and Profit scheme by the manufacturer. A memorable episode of the TV series involved a Soviet defector bringing an experimental mech to a Japanese seaside resort town where everybody was actually a spy of some sort. The second movie mentions the end of the Cold War, but it's uncertain if this is a Retcon or if it happened sometime between 1998 and 2002 in the movie-verse. Angel Cop suffers from this as it takes place under the belief that the Japanese economy would continue to grow; instead, the economic bubble popped in the mid '90s. GoLion started with Earth being destroyed in World War III, when the east and west finally launched their missiles at each other in 1999. 009-1 the anime takes place in an alternate world where the Cold War continues... because the original manga was made in the 1960s and used the Cold War. In Otaku no Video, made in 1991, the Iron Curtain still exists and Gorbachev is still in power in 1997. In AKIRA, set in 2030, a Soviet Navy helicopter transports scientists to an American aircraft carrier. In the comic Camelot 3000 King Arthur and Merlin are resurrected and their knights reincarnated in the year 3000. Almost nothing has changed politically since the 1970s or early 80s, except that there are now four power blocs. The USA has a Ronald Reagan-esque president who dresses as a cowboy and carries authentic sixguns. The USSR is led by Comrade Yazof, a Brezhnev lookalike; China is led by Chairperson Feng (a lady Mao); and Africa by The Supreme Rakma, an Idi Amin type. Apartheid also still exists, and Gawain is reincarnated as a black South African. And this is after a nuclear war that blasted man back to the medieval period. The Marvel Comics group called the Soviet Super-Soldiers is an unusual example because stories set in the present were affected. This happened because Comic-Book Time slowly pushes forward the date of any present-day stories. Several years after the breakup of the USSR the group not only wasn't Soviet, but none of its previous adventures were either. This resulted in an embarrassing time period when it was carefully left unnamed every time it was used, until Marvel finally settled on "Winter Guard" as the name it always had. An early issue of Ultimate X-Men featured the X-Men foiling a plot by the Provisional IRA. At the time, the 1998 Peace Agreement was still young, and many suspected it might not hold. It did, and the Provisional IRA destroyed its last weapons and ceased to exist some time around 2005. American Flagg! dances on the verge, but still manages to fall into this pit, though it falls very gracefully. The sight of ultra-capitalist Soviets and "Stalinland" theme parks fifty years in the future (in a mid-to-late 80s comic which ended just as the Berlin Wall fell) seems almost like a foreshadowing. In early Judge Dredd comics, the Soviet Union is depicted as surviving into the 22nd century, having been renamed as the 'Sov Blok', and is depicted as the main villain in the Apocalypse War storyline. In later comics, it enters a Glasnost period, before reverting back to its previous militaristic self, although it uses the Judge System instead of being communist. By extension, this occurs in other strips which take place in the shared universe, such as Harlem Heroes. In IDW's Transformers: Escalation, much of the plot during the second half or so consist of the Decepticons trying to stir up conflict between the Soviet Union and a breakaway republic called Brasnya. This was written in 2006. Explanations, please. They started referring to Russia (and Brasnya as a "former Soviet republic") from issue 5 onward, and Simon Furman admitted the Soviet references in the earlier issues were errors. 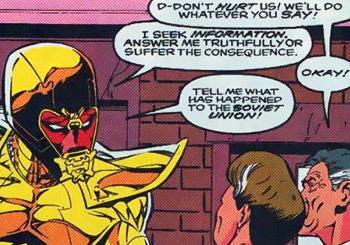 Nexus, set in the 25th century, really got hit by this, since the ongoing Cold War between the Sov and the Cohesive Web was a significant plot point of the story. The writers had the good sense, though, to just say that, well, at some point between now and then, the Soviet Union was reestablished and in turn established an interstellar colonial empire to rival America's. The funny part is that the story, including the ones written back in the seventies, repeatedly refers to the Sov as being in decline and on the brink of collapse. While the present day period of Nth Man: The Ultimate Ninja is never established, it's suggested to be on or near 1989, when the first issue was published. Reading it in hindsight can feel rather anachronistic, given how much of the story relies on Cold War tensions and the Red Scare (particularly an exchange of warheads between the US and the USSR). In Kamandi: The Last Boy On Earth, the map of the Uplifted Animal-controlled post-apocalyptic Earth shows that Siberia is now the "Communi-Bear Silo State". Human civilization has collapsed entirely, but Russia is still communist. Strikeforce: Morituri managed to get things wrong in both directions at once. The story is set in 2072, but the Soviet Union still exists under the "Paideia" One World Order. However, a memorial seen in one panel implies that South African apartheid collapsed in 1989, a few years too optimistic a prediction. This is why Black Widow was Retconned into possessing slowed aging. Marvel wanted to keep her Cold War ties and her back story as a Soviet super spy without having to retroactively make her appear decades older. In the universe of The Uniques, the Cold War lasted until at least 1993, thanks to the Uniques replacing conventional weaponry. Among other effects, this has resulted in the Republicans maintaining their hold on the White House; it's mentioned that in 1996, when the story opens, Newt Gingrich is the President. It also resulted in an overabundance of unaffiliated Uniques serving as either vigilantes or supervillains. In 2001: A Space Odyssey the Soviet Union was certainly around, evidenced by Dr. Heywood Floyd's meeting with some fellow space scientists from the Soviet side on his way to the Moon. The book also detailed a USA-USSR pact opposing China, which is the opposite of what happened in real life, but was plausible in the 1960s when written due to border clashes between China and the Soviet Union (Hunter S. Thompson was writing about the possibility as late as 1974, although that's partly because of his conviction that Richard Nixon was the Devil). By contrast, the plot of 2010: The Year We Make Contact revolves almost entirely around Cold War tensions between the Soviet astronauts piloting the Alexei Leonov and the Americans who need their help to reach the wreck of the Discovery. Although not the book's, which is why a few lines about peace are tacked on with the message at the end of the film. Spoofed in Austin Powers: International Man of Mystery. The title character, after being frozen in 1967 and unfrozen in 1997, is shocked at the presence of a Russian intelligence officer. When he is told that the Cold War ended, he initially assumes that the Communists won. Ditto in the surprisingly entertaining Brendan Fraser film Blast from the Past. After emerging from their fallout shelter after three or so decades, the father (Christopher Walken) refuses to believe that the Soviet Union collapsed without a fight. "I bet they asked us for aid!" It's all an Evil Plan to get our money! Dirty Communists! At the end he's setting up to build another bunker, convinced they never really collapsed. In Underground, a group of Serbian war refugees is duped into spending 20 years below ground making weapons to fight the Nazis, being told that the war continues to rage above their heads. When a few escape, they're quite confused. Averted in A Good Day to Die Hard, which includes a scene where John McClane and a friend talk in an NYPD shooting range with a picture of President Obama in the background. The film was released in 2013 but filmed prior to the 2012 presidential election. Therefore a second version of the scene was shot with a picture of Mitt Romney in the background as insurance in case of a Republican victory. RoboCop (1987), set at some unclear future date after 1987, implies that the Cold War is still going on, with references to SDI and the MX missile. The latter, which became the Peacekeeper, has now been scrapped. References are also made to the South African apartheid government which is not only still in power, but actively threatening to deploy a Neutron Bomb against insurgents, thus promoting them from racist assholes to cartoonish supervillains (although, in Real Life, they did have nukes). In the film version of Pushkin's poem Onegin, there is a throwaway line about communism, which is pretty good going for a story published 16 years before the Communist Manifesto. A less egregious example of this as regards foresight about 1917 comes in the 1990s Sean Bean/Sophie Marceau version of Anna Karenina, where Vronsky is the one making throwaway remarks about the coming of communism in the 1880s, when such fears would have been more realistic, though still slightly misplaced. It seems from historical films about Russia set in the 19th century that the whole country had nothing better to do than to muse upon its ultimate 20th century fate. That's what Billy Wilder's otherwise pretty good One, Two, Three suffered from. Originally a light-hearted comedy with Dirty Commies, it became a massive case of Too Soon when the Berlin Wall was built (during filming!). Before August 1961, people could cross the border between West and East Berlin quite easily - which millions of East Germans used to move to the golden west. The movie was based on this premise and suffered when the wall was built. In Star Trek IV: The Voyage Home, during a global loss of power, Leningrad's power grid is described to have collapsed. Leningrad reverted in 1991 to its pre-revolutionary name, St. Petersburg. The name of the oblast, on the other hand, is still Leningrad. If the power grid includes the entire area, the statement is technically correct. Star Trek VI: The Undiscovered Country was made as a commentary about the Cold War winding down, though it came out a few weeks before the Soviet Union actually collapsed (it's Star Trek counterpart does not). Notably lampshaded in the James Bond film GoldenEye. The film starts out during the late Cold War years, and TimeSkips to a visibly post-Soviet Russia. Averted with the previous film, License To Kill, which came out just before the Soviet collapse. The film-makers weren't sure whether the USSR was still going to be around by the time the movie was finished, so they purposely crafted the plot around something completely unrelated to Communism. An inversion of sorts. The DVD menu for Indiana Jones and the Kingdom of the Crystal Skull includes a shot of a world map . It's a post-Cold War map, even though the movie is set in 1957 and the Soviets are the main villains. Played straight in 2007's Planet Terror, in which the leader of the infected soldiers claims his team had already killed bin Laden, but the circumstances would've embarrassed his superiors so they kept it quiet. Inverted in Cool Runnings, which was made in 1993 and set in 1988. At one point, the flag of The New Russia is anachronistically included amongst the flags of the nations competing at the 1988 Winter Olympics. Period appropriate Soviet flags and insignia are seen elsewhere in the film, however. The USSR still exists in Blade Runner 2049 as a deliberate attempt to maintain the aesthetic of the first film. The book 2061 not only has the Soviet Union still around, it has South African apartheid continue until the 2030s, when it is destroyed by a violent revolution that scatters the Afrikaners across the Earth and Solar System. They more or less become the new Jews. The 2001 series had a sort-of double mess-up. In the first book (and movie), though the USSR is still around, it and the US are cooperating and have friendly relations (as shown by Floyd chatting casually with Soviet citizens, who are also clearly friends, on the space station. They even inform each other that they're always welcome to come by to visit whenever they just happen to be in each other's countries). When Clarke wrote 2010 (in 1982) it was obvious the real-world US and USSR were not quite being so friendly, so he decided that there should be conflict between the Soviet and American astronauts because of their respective countries' rivalry (though not as blatant as in the film, where the two countries are at the brink of war). Of course, fast forward to the real year 2001, where Soviet Union is gone, the US is supreme, and where, in fact, Russia and the US are building a joint space station, though not one as big and fancy as the one in the book. In a bit of a meta-entry, several techno-thrillers and what-if war novels from 1978's The Third World War though 1984's Red Storm Rising to 1990's Sword Point, all written prior to the end of the Cold War have World War III end up in a status quo ante peace treaty, where other than a few million dead, the Superpowers continue their struggle against each other as if nothing happened! It was almost as if no author could remember a time before the two super powers, or imagine a time after them. One of the few that averted this was, ironically, the first listed. The Third World War had the Soviet Union abruptly collapse after the nuking of Minsk (in response to the Soviet nuking of Birmingham, England), with the 1982 sequel/expansion detailing how it happened. John Wyndham appears to have been among the first people to believe the Soviet Union was going to collapse at some point, and not in a manner that took human civilization down with it, because any of his books that are set in what in the 1960s would have been Next Sunday A.D. usually include a bit of exposition about the Cold War. The Gates Of Eden by Brian Stableford is set in 2441. The captain of a returned cold-sleep ship is surprised, not to say exasperated, that after 350 years and one ecological collapse there is still a "West" and a "Soviet bloc", "and they're still 'they' and we're 'us'." On the other hand, the deep space arms of both groups care less and less about what Earth thinks. In the prototypical Cyber Punk novel Neuromancer, the Soviet Union is still alive and kicking; in fact, it's the United States that's fallen apart. Quoth Gibson: I wrote the book so that it`s impossible to prove from internal evidence that the United States exists as a nation state. It seems to exist as some sort of congerie of city states and, possibly as the result of some semi-abortive not too bad sort of nuclear war... But I left the Soviet Union looming and rusting away, a sort of slag heap. I never imagined that it could dry up and blow up away. While in Robert A. Heinlein's Friday the USSR fell only after the dissolution of the USA. Neuromancer and its sequels also feature a world dominated by Japanese corporations, echoing the very common theory that Japan would emerge as the world's dominant economic superpower once the United States and the Soviet Union inevitably bankrupted themselves through rampant defense spending. Idoru, written in 1996, has Russia transform into a kind of criminal empire run by the The Mafiya, which was a fairly common speculation of Russia's future in the West during the Yeltsin years. The Sum of All Fears is a close one-written in early 1991, months before the breakup of the Soviet Union, and revolves around a "hoaxed" Soviet attack on the US in January 1992, by which time the USSR had been formally dissolved for a month. Not a trick, Ortiz [a CIA agent] noted. He called it a tactic. He wants to go after transports now, he wants to kill a hundred Russians at a time. Jesus, what have I made this man?note Later the same character snaps at his aide and demands that he shows the Afghans some respect because of all they had suffered through after said aide dismisses them as brutal, primitive "sand-niggers." Fantastic Voyage: This novelization of Fantastic Voyage has two superpowers referred to simply as "Us" and "Them". In-Universe, characters mention that the political maps have changed over the years. The maps used to show "Us" (and allies) as a pure pristine white and "Them" (and their allies) as a deep, brooding, bloody red, but now both sides are depicted in pastel shades. It's also implied that the political ideologies have drifted closer together. Fantastic Voyage II: Destination Brain: This story keeps the muted/thawed cold war aspect from Fantastic Voyage, but dispenses with the "Us" and "Them" in favour of openly referring to the USA and the Soviet Union because the protagonist is American (and not a double agent) who spends most of the novel in the Soviet Union working with Soviet citizens, so sticking to Us/Them would have been very awkward (whose us and them?). "Lets Get Together": There are two superpowers who are usually referred to as "Us" and "Them". It's supposed to be America agaisnt Russia despite being set decades into the future, where his Deceptively Human Robots are used as weapons of infiltration equipped with a Self-Destruct Mechanism. The Doctor Who New Adventures novel Eternity Weeps, published in 1997 but set in 2003, features Iran and Iraq soldiers competing to acquire an alien artifact. No one could have foreseen that in 2003 Iraq would be occupied by the US-led coalition. While not a Sci-Fi novel, the Dale Brown novel Sky Masters was published in 1991 and set in 1994. It makes references to the Soviet Union (which would cease to exist at the end of 1991) and features the Strategic Air Command in a prominent role. The SAC would be abolished in 1992. A major plot point of Eon, the Greg Bear novel written in 1985 and set in the early 21st century, is that the USSR still exists and the Third World War breaks out between it and the USA. On the other hand the plot makes extensive use of the concept of parallel worlds and alternate histories, which handwaves the problem away: The story is not taking place in our timeline. The Saga of the Exiles by Julian May takes place both in the 21st century and in the Pliocene. The Soviet Union plays a prominent, but peaceful, role in psychic research. The author has had to dodge the Soviet issue in the sequels. The Third Millennium, a book of future history by David Langford and Brian Stableford, written in 1985, has communism (and capitalism) collapsing in the mid 21st century, but the USSR existing as a political entity right up until 3000. Jerry Pournelle's CoDominium is a world government evolving out of cooperation between the US and USSR in the 1990s. When the real 1991 came around, Pournelle retconned the timeline so the CoDominium was founded in 2000. Not to mention also adding a Soviet coup to reestablish the USSR 20 minutes into the future, which had collapsed in reality. Interestingly, novels set later in that universe—like 1974's The Mote in God's Eye—avoid the problem. In the far future, a post-communist Russia venerates both its Communist and its Imperial past—so there's a Russian (and Eastern Orthodox) world named "Saint Ekaterina" with a battleship named Lenin. Under Putin in recent years, Russia has been doing just that. The Eclipse trilogy by John Shirley happens in an early 21st century with a Third World War between NATO and the Warsaw Pact bloc. It was retconned later to a revived Soviet Union. Ender's Game, which was first published in 1985, was released in a new edition in 1991 so that references to Russia would reflect the decline of the Soviet Union. The sequel Ender's Shadow trilogy did not anticipate South Sudan becoming independent. The Third World War: August 1985, a 1978 mock-history book on a World War III, has the USSR collapse in 1985... In a highly violent manner after the nuclear destruction of Minsk, now Belarus, and Birmingham, UK. In The Stand, written in 1979 and set in 1990, an American general instructs his subordinate to release a virus in each of the Soviet satellite states. The Dead Zone has a relatively minor one: Johnny Smith's vision of a future nuclear apocalypse ushered in by President Greg Stillson. Smith predicts that the war will originate in South Africa which, at the time the book was written, was pursuing a nuclear weapons program under the direction of the apartheid government. However, South Africa dismantled its arsenal in 1989, three years before Smith predicted Stillson would be elected. The Zone World War III novels by James Rouch (written in the 1980s, though an actual year is never mentioned) are now referred to as Alternate History for this reason. James Blish's Cities in Flight series involves the Western democratic government model becoming ever more intolerant, eventually resembling the Soviet model very closely, and then the Soviets winning the war (and absorbing the West) because they were better at being Soviets. Mack Maloney's Wingman series, first published in 1984, had World War III take place in the 80s, and in the 90s, some time after the real-life collapse, the Soviet Union (which somehow still exists despite being bombed into oblivion in the war) uses a traitorous Vice President to let them bomb and take over the United States. A Woman of the Iron People by Eleanor Arnason (copyright 1991) not only has the Soviet Union survive, it has communism as the dominant political system of Earth at the time of the First Interstellar Expedition (on which the main characters traveled). Joe Haldeman's book Worlds, written in 1981, is set in roughly 2085, with a significant population living on satellite semi-independent "worlds" in space, but makes note that on Earth, most of Asia is now part of the "Supreme Socialist Union." John Brunner's Stand on Zanzibar actually handles this pretty well, despite being written in 1968. The USSR isn't gone in 2010, but it's mostly defunct and implied to be Communist only in name, and the real threat is ... China. A lot of other predictions in the book are surprisingly accurate as well. The short story "Fire Watch" by Connie Willis derives substantial drama from time traveller John Bartholomew's difficulty in resolving the cognitive dissonance caused by observing a 20th century British communist serving on the St. Paul's Cathedral fire watch during WWII while knowing that St. Paul's will be destroyed by the USSR during the 21st century. This point is retconned in later stories, leaving the plot of "Fire Watch" somewhat confusing. In the 1990 short story "The Emperor's Return" by Harry Turtledove, the Soviet Union invades Turkey in 2003 - and not only that, Greece has gone communist as well and is allied with the USSR. Now, since Turtledove has made most of his career writing Alternate History, Fantasy or any possible combination of bothnote The story itself features a prophecy and a time-travelling Byzantine emperor it's very easy to handwave that. In the novel President's Vampire by Christopher Farnsworth, Cade, the eponymous vampire, assassinated Osama bin Laden as he was fleeing Tora Bora. This could not be revealed to the public without breaking the Masquerade, especially after bin Laden revealed his true form as a Deep One. After bin Laden's real life death, a later book in the series has an offhand mention of the government staging said death for the sake of political capital. In Voyage from Yesteryear by James P. Hogan, the Soviet Union is stated to have collapsed in 2021. In Simon Hawke's The Wizard of Camelot, a resurrected Merlin is nearly assassinated by a Provisional IRA terrorist in 2182. Even if the Good Friday Accords fail in the future, those splinter groups which still agitate against peace in Northern Ireland now spurn the "Provo" name. Norman Spinrad's 1991 novel Russian Spring was overtaken by events within months of its publication. The novel was an extrapolation of the events that actually led to the fall of the Soviet Union, but predicted a more gradual, on-going evolution and opening-up. As the old guard of Soviet leaders continued to age and die, a new generation of young Russians became adept at working around the restraints of what was left of Communism, and started a cultural and artistic renaissance that soon became the envy of the rest of Europe, while America became increasingly insular and stagnant. The early books of the Venus Prime series, being based on old short stories written by Arthur C. Clarke and having been started in the eighties, imply that Russia is still Communist, despite taking place at least a century into the future. The last book, written more recently, clarifies that the Soviet Union is still around (or reformed itself), but the second "S" in USSR stands for something other than "Socialist", and apparently, there are still Russians who want to return their country to socialism; the Soviet colony on Mars featured in the third book was an attempt to pacify them. Clive Cussler's Corsair is centered in Libya where Muammar Gaddafi announces an increased co-operation with NATO in anti-terrorism efforts. The book was written just two years before the Libyan Civil War. Jerry Ahern's epic pulp/men's adventure series The Survivalist begins with the Soviets invading Pakistan to try to stabilize Afghanistan during their occupation of it, which starts a nuclear war. The series continues with post-Apocalyptic schemes between the US and the USSR continuing to dominate the main plotline, including a fleet of Space Shuttles and some serious Soviet Superscience. Louis-Sébastien Mercier's L'an 2440 ("The Year 2440"), published in 1770, is an old example. Predicting what France would be like in 2440, Mercier believes France would still have a hereditary monarchy (albeit a constitutional one), although his future France has, like modern France, seen its nobility abolished. The Dark Forest by Cixin Liu, originally published in 2008, has a meeting 20 Minutes into the Future between a former American secretary of defense and an aged Islamic fundamentalist hiding out in Afghanistan who is clearly intended to be  but not named as  Osama bin Laden. The English translation of the book didn't appear until 2015, meaning that the mess-up was baked into it from the start. In the web-novel Domina, the Soviets are mentioned obliquely a few times even before the reveal that the story takes place in an alternate 2001. The timeline changed in 1970, and apparently one of the effects is that the USSR never fell. The Cold War appears to be long over, though, and the Soviets maintain the space station that serves as the communications hub for the space colonies. In the 1965 novel "The Star Fox" by Poul Anderson, there's a reference to the Russian Republic, which is also noted as being 'amiably inept'. (Poul Anderson was a noted anti-communist). Even scholars on the subject were caught off-guard. History Professor Michael Hughes of University College of Wales, in the epilogue to his book Nationalism and Society: Germany 1800-1945, ends with speculation on the subject of German reunification. He quickly dismisses it as impossible, as it would require the dismantling of the Soviet Union and its European Empire. The book was published in 1988. On the other hand, he was completely right that the only way for it to happen is if the Soviet Union entered into a terminal collapse. He didn't predict reunification but the correctly assessed what would be needed for reunification to happen, although the Soviet Union limped on for another year after Germany was reunified. In an attempt to defy this, Charles Stross has put the third book of his Halting State series, The Lambda Functionary, on indefinite hold until Scotland decides whether it's going to stay in the United Kingdom or not. The original James Bond novels were primarily about Bond fighting agents of the Soviet spy organization SMERSH. But Ian Fleming began to worry that the Cold War might end at some point and leave his stories feeling dated. So when writing Thunderball, he decided to come up with SPECTRE, an apolitical, multinational terrorist organization with a tendency to play both sides of the Cold War and other conflicts for their own schemes who could fit into any political context imaginable. A poster in Red Dwarf, on board on a ship that left the solar system in either the 21st, 22nd or 23rd century depending on the series, features a rather prominent Soviet flag. There was also an episode in which the characters become convinced they're in Bulgaria, and seem to think it's still part of the Communist bloc. Chekov mentioned Leningrad in two separate episodes of Star Trek: The Original Series and, unlike the Trek example above in film, both are clearly references to the city. On the plus side, Chekov always referred to his homeland as "Russia", never uttering the words "Soviet Union" or "USSR". It's pretty clear that the writers imagined Russia would still be like the Soviet Union in the future (minus the Cold War, of course, since Earth is completely at peace in the twenty-third century), but the fact that they didn't actually call it that makes it easier to Hand Wave.note Funnily enough, Anton Yelchin, who later played him in the new movies, was actually from Leningrad before his family emigrated to the US. The second episode featured the SS Tsiolkovsky whose dedication plaque reveals that it was built and launched in the USSR in 2363. In the episode "The High Ground", Data casually mentions that a series of terrorist attacks led to the reunification of Ireland into a single state in 2024. At the point the episode was released (1990), a peace treaty was seen as utterly inconceivable, let alone that it would take effect by the end of that decade. Of course, reunification in full has still not happened, and probably won't for as long as the United Kingdom remains; even if such a decision were made, it is unlikely to occur prior to 2024. Incidentally, the reference to Ireland being reunited due to terrorism led to this episode being banned on British television for years afterward. It was finally shown on the BBC in 2007. It has never been shown on Irish television. In-universe in the Star Trek: Voyager episode "Future's End". When Voyager is sent back to 1996, Tom Paris, the ship's expert on the 20th Century, enlists the aid of an astronomer called Rain Robinson, claiming to be a CIA agent investigating a Soviet plot. When she tells him the USSR collapsed five years ago, he pauses for a second and replies "That's what they want you to think!" While not being explicit about it, the story Warriors of the Deep (set circa 2084) involves two superpowers armed with nuclear weapons that highly mistrust each other. The Doctor even comments that nothing has changed: "There are still two power blocs, fingers poised to annihilate each other." To make things vaguer, Ingrid Pitt's character has an Eastern European accent (she was born in Poland). The Novelization doesn't even have the half-assed aversion; the blocs are named as East and West, and the sea base residents (the "good guys") are from the West Bloc, while the East Bloc has a policy of "uniformity, obedience and central control". It was not adapted by the original writer, and shoots any subtlety in the original setup stone dead. Several UNIT stories produced in both the 70s and the 80s also mention the "end of the Cold War" but still have a USSR. This combines The Great Politics Mess-Up with the UNIT dating mess-up, since UNIT stories were notoriously vague and contradictory as to whether they were 20 Minutes into the Future or The Present Day. The miniseries Amerika posits a U.S. that was taken over by the Soviet Union in 1987 and was now Soviet-occupied territory. The reason given in the movie as to why this happens is "American apathy." To contrast, there is also a novel entitled USSA: United Soviet States of America, which is a murder mystery set in American-occupied Russia. Stephen Colbert insists the Cold War is still going on, and has periodic Cold War Updates whenever anything newsworthy happens in Russia. The introduction to 'Kickpuncher' in Community episode "Romantic Expressionism". Kickpuncher Narrator: "It is the year 2006 A.D. and nuclear war has ravaged the planet." Abed: "Must have missed that." Star Cops includes a recurring character who is generally referred to as Russian, but clearly has the Soviet flag on his uniform. The premise seems such that the major Cold War tensions have eased and the two superpowers have learned to get along...more or less. Sort of like the way it is now between the US and Russia. The first episode of Space: 1999 (set in, er, 1999) has a news report referring to Yugoslavia. Technically, Serbia and Montenegro still called itself Yugoslavia until 2003 (although they had a hard time getting the rest of the world to do the same), but Yugoslavia as it was known in the 70s ceased to exist in 1992. Carl Sagan's Cosmos: A Personal Voyage, which was produced in The '80s, featured in the original run afterwords in each episode that mentioned the Soviet Union. Later the Special Edition of the The '90s acknowledged this trope in more updated afterwords like the one on the final episode "Who Speaks for Earth? ", where it mentions that the world has changed: "Walls have come down and Irreconcilable Ideologies have embraced" while showing footage of the fall of the Berlin Wall, the abolition of Apartheid in South Africa and the iconic handshake between Yasser Arafat and Yitzhak Rabin in front of Bill Clinton. In Moonbase 3, the Soviet Union still exists in 2003. It operates Moonbase 2, one of five lunar outposts (the others being operated by the US, Europe, China and Brazil). Furthermore, in the fifth episode "Castor and Pollux", it is revealed that the Soviets are on the verge of sending a manned mission to Mars and that their long-term goal is to launch a manned orbital flight of Jupiter using Mars as a springboard. David Bowie's "Where Are We Now?" reeks of Cold War-era nostalgia, likely inspired by David Bowie's Berlin period , and is a reflection on post-reunification Germany. The second edition of the Cyberpunk game (Cyberpunk 2020) was published in 1990. The fall of the Soviet Union is mentioned in the timeline (as is Germany's reunification), but it was eventually replaced by the Neo-Soviet Union by 2020. Apparently the game's writers didn't really know how to handle a collapsed USSR. The first edition of Shadowrun had references to the Soviet Union in its future history, while the second swapped these out for the Russian Federation. Later editions said to hell with it and admitted the game's timeline is an Alternate History. This hit the game Twilight: 2000 particularly hard, as the premise of the game was that it was set during or just after World War III, after the Soviets had rolled over the Fulda Gap... in the year 2000. They tried a Retcon that only ended up torking off the Germans (predicating the war on Germany's invading Poland...) before reverting to the original plot, throwing up their hands and declaring it an Alternate Timeline. Most of the relevant parts of the BattleTech timeline are in the middle parts of the 31st century, so it's a petty detail — but the game's timeline includes a second "Soviet Civil War" in the early 21st century, just before the first manned flight to Mars. Newer materials haven't retconned this; presumably, it's just assumed to be an alternate reality. Actually similar to Shadowrun (only logical since both were created by the same company), it was at one point mentioned that an attempted retcon to the Russian Federation was made, before the creators gave up and as much as declared (Particularly joked on on the BattleTech forums) that BattleTech is not our future but rather the future of the mid 1980s. Which actually explains quite a bit, including the bulk of much of the computer equipment in the game in comparison to modern computers and the like. Steve Jackson Games' Illuminati card game (first published in 1982) assigned groups various alignments that (mostly) came in opposing pairs; one opposing pair was "Government" and "Communist". When they adapted the concept into the Illuminati: New World Order Collectible Card Game (in 1995), "Communist" was demoted from an alignment to a secondary "attribute", and the "Corporate" alignment was introduced as the new opposite to "Government". Paranoia has some kind of world-ending catastrophe in its backstory, and though the details are vague and obscured by time, secrecy and misinformation, the main culprits that The Computer suspects are Communists, hinting at World War III. Not surprising, since the game first came out in The '80s, but not the first people you'd blame these days. On the other hand, records of the past are so mangled and manipulated that it hasn't affected the setting. The core drives behind the setting have proven remarkably resilient. As the Kickstarter for the 2015 edition says, "The original Paranoia was a product of, well, Cold War paranoia. Today, we have no need to be paranoid! The NSA and GCHQ work tirelessly to ensure that we are all safe and secure against the pervasive threat of Commie mutant trai.... Uh, I mean, evil, crazed terrorists." GURPS Terradyne has a much-reduced (with only five republics left) USSR in the year 2120. Again, this was written in the period where it was expected that some states would peel off from the Union but not that it would break completely. Rifts has a weird example. The Sourcebook Warlords of Russia was written well after the fall of the Soviet Union (the game itself came out in 1991), yet one of the power blocs mentioned in the setting is a group called the "Sovietski." The book explains that they are the remnants of a second Soviet Union that was formed in the 21st Century before the Coming of the Rifts. The musical Chess was originally released as a Concept Album in 1984, at the height of the Reagan-era Cold War tensions. Set in the "current day", the plot relied heavily on those tensions. By the time it reached Broadway in 1988, glasnost was in full swing and the impending fall of the Soviet Union was already visible on the horizon. As a result, vast swathes of the story — and several of the songs — had to be rewritten to accommodate the new political reality. (For instance: in one of the dropped songs, the civil servants of the Russian embassy complained that so many Russians defecting to the West "makes you wonder what they built the Berlin wall for"; in a newly written song, a CIA agent and a KGB agent agree to cooperate to the point where "the Berlin wall becomes a backyard fence.") Modern revivals of the show seem to be getting round this by more-or-less sticking to the plot of the album, and simply making the whole thing an early-80s period piece. The avant-garde playwright Richard Foreman titled his 2001 play Now That Communism Is Dead, My Life Feels Empty! This is a common trope in very old sports games (especially in sport simulations like Football Manager) since you can manage teams from pre-Cold War era and control them until beyond the 90s without any changes. The original arcade edition of Street Fighter II was released less than a year before the fall of the Soviet Union and had one of its fighters, namely Zangief, as a Soviet representative. His ending sequence even features Mikhail Gorbachev, who is helicoptered in to congratulate him on his victory, espousing the greatness of the "Soviet spirit". Despite subsequent editions of the game being released after the fall of the Soviet Union, Zangief's nationality and ending remained unchanged, although the SNES and Genesis ports attempted to somewhat fix that by having Zangief address Gorbachev as "Mr. Ex-President". This was justified in the Alpha series, which took place chronologically before Street Fighter II, but other games don't have this excuse. It wasn't until Street Fighter IV that Zangief's nationality was officially changed to the Russian Federation, with the current flag. To make it even less consistent, Hyper Street Fighter II, released in 2004, changed the flag of Hong Kong from its earlier British colonial flag to its current five petal design while keeping Zangief's Soviet nationality. And Hong Kong was under British control for the entire history of the Soviet Union! Metal Gear 2: Solid Snake, first released for the MSX2 in 1990, not only predicts that the Soviet Union will still be around in 1999, it also features a character named Natasha Marcova (Gustava Heffner in later versions) who works for the StB (the Czechoslovakian Secret Police), a real-life organization that was dissolved during the very same year the game was released. The original Strider assumes that the Soviet Union will still be around by the year 2048. In fact, the first stage is set in the Kazakh Soviet Socialist Republic, a former Soviet state now known as Kazakhstan. In most of Strider's sequels, the political future of the world is not addressed, but in the 2014 remake the developers simply ran with the original idea and you're still chopping up Cossacks and proletariat dragons all while a a man over a PA system spews vaguely socialist-sounding idioms. Harpoon was released in 1989 and one expansion pack assumed that the Soviet Union would still exist in 1996. After the USSR's collapse, there was a big scramble to create new scenarios that weren't obsolete. Of course, since it was a simulation the existing ones were still developed. Aerobiz: The second entry in the series predicted supersonic airliners and 1000+ passenger super-jumbo jets in the 2000s, missing the large scale move from regular airliners to smaller, more fuel-efficient Regional Jets for most small and medium-sized routes. It also failed to portray a large number of very prominent cities that cropped up in the late 1990s & early 2000s, such as Dubai, and the terrible economic impact that the 2000's would have on airlines around the world. On a lesser scale, it also predicted the next Airbus airliner would be the A350 (which is only now being conceptualized), and that McDonnell-Douglas would produce the early concept "MD-12" (a stretched MD-11) and still be an independent manufacturer. The Chaos Timeline has its own version for in-universe works done before the Logo and AI-induced abortion of World War III but set 20 Minutes into the Future. Played with in 1983: Doomsday. The Soviet Union survives as the Union of Sovereign Socialist Republics, and is one of the main powers in the post-World War III world. But it's the United States that (largely) splinters into several survivor countries and factions. Knights of Buena Vista is a Campaign Comic covering the Disney Animated Canon. When they are playing Wreck-It Ralph, it turns out that Zangief still doesn't know the USSR fell, and no one's had the heart to tell him. After the 2016 Brexit vote, the satirical news website The Babylon Bee ran a story saying that the "leave" result had sent pre-millennial dispensationalist Christians scrambling to adjust their end-of-the-world predictions to compensate (because many of said theories relied on the European Union being the first step to the one-world government of The Antichrist). Archer, being the Anachronism Stew that is, has the Soviet Union as a recurring villain, despite being ostensibly set in the present day. The Soviet Union somehow exists in the third season of The Transformers, produced in 1986 and set in 2006. The animated series Spiral Zone, produced in 1987 but set in 2007, assumes that the Soviet Union still exists in the early 21st century. Captain Planet and the Planeteers ran straight into this. The show began airing September 1990, at which time Linka (wind) was from the Soviet Union in the introductory opening. When they finally got around to updating the intro (it took a while), she was from Eastern Europe. note The USSR covered a big chunk of Asia as well as Europe, but Asia was Gi's continent of origin. Also, most of the USSR's population lived in the European part of it. In Gravity Falls, Rumble McSkirmish, a character from a Street Fighter II parody brought to the real world, orders Dipper to take him to the Soviet Union, who responds how that's going to be difficult for a number of reasons. Much of the "provisional" government buildings in Bonn were being replaced in the 1980s, after everybody had accepted that the partition of Germany would be forever and they just might as well build decent government buildings if they had to stay in Bonn. German unity was actually debated in a former water distribution plant while a new parliament was being built. Some ministers still have their official seat of office in Bonn and most of the others have an official secondary seat there. Some other former government buildings have been given to international organizations and still most of the "shiny new" buildings from the 1980s sit empty today. In 1922 British Prime Minister David Lloyd George suggested that a good temporary solution to the growing religious, political and territorial tensions in Ireland would be to allow the more British-leaning counties of Ulster to be governed from Belfast, while the remainder of the region would be governed from Dublin with the two governments being separately elected and be allowed to pursue different policy paths. It's now pretty much AN ENTIRE CENTURY later and the "temporary" solution is still in place. Australia under Gough Whitlam recognised the Baltic States as part of the Soviet Union, believing that was permanent.